Cable One Inc. will remain the company's corporate name, but the consumer-facing brand change is a marketing play that has also been run by some of its US peers -- Comcast Corp. (Nasdaq: CMCSA, CMCSK) with "Xfinity," Charter Communications Inc. with "Spectrum" and Cablevision Systems (now part of Altice USA) with "Optimum." But Cable One's brand change also centers on the ongoing shift of the operator's services strategy -- to focus heavily on high-margin broadband, and to greatly de-emphasize (shun?) efforts tied to a declining (and much less profitable) pay-TV business. That pipes-over-programming strategy also ties into how Cable One is portraying the new brand, holding that Sparklight "illustrates the speed and connectivity the company is known for." Sure, that's a nice dose of marketing-speak. But, while Cable One's pivot away from a video-led strategy has prompted some skepticism, a top industry analyst, Craig Moffett with MoffettNathanson LLC , has begun to warm to it as it becomes clear that cable service product mix -- particularly when that mix is heavier on the broadband side -- is now increasingly important. Certainly, fixating on "connectivity" hasn't been lost on other MSOs. Cablevision execs used to talk it up quite a bit. Comcast has likewise admitted that broadband has become the "epicenter" of its relationship with customers. Charter, according to industry sources, is preparing to greatly cut down investments in its own legacy QAM-based video infrastructure next year as it pumps more into new IP-based video tech and services. Speaking at an investor conference last week, Charter CEO Tom Rutledge stressed that "what we sell is a connective relationship to the customer," but quickly added that "[v]ideo is important to that." So, Charter's not about to relegate itself to simply being a dumb pipe. As part of his updated view on Cable One, Moffett last week upgraded Cable One from "Sell" to "Neutral," and raised his target price on the stock to $875, from $543, based on a revised multiple of 11.7x EBTIDA. A big reason for that is Cable One's heavier skew on broadband, which is simply a better business than video, and therefore ought to carry a higher EBITDA multiple, according to Moffett. Spotlighting broadband is central to Cable One's game plan, so it follows that the MSO should be trading at higher multiples. And it is. 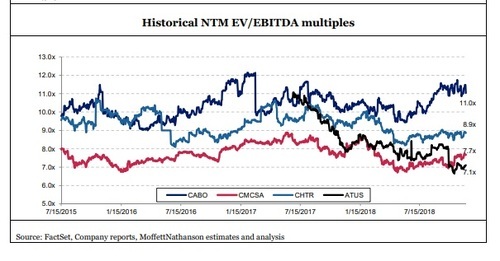 Moffett notes that Cable One is trading at about 11x EBITDA, a 25% premium to Charter, 30% to Comcast's implied cable-only multiple, and a whopping 55% premium to Altice USA. "By virtually any measure, broadband is a better business than video," Moffett writes. "Broadband has higher margins. It bears lower capital intensity. It is less competitive. And, of course, it has (much) better growth potential (which isn't saying much... broadband is growing nicely, while video is shrinking)."